These past few days I've spent alongside my mother, who has been, quite abruptly, diagnosed with terminal cancer throughout her body. We've spent time holding hands and sharing about life and memories of the past. We've had conversations about streets of gold and seeing Jesus face to face. We've sat in silence as the tears came to my eyes, despite her wishes for us to be joyful for her. We've even planned her Celebration of Life with her admonition to not wear black but "happy colors!" Yes, she is tired and her body weak. But, Mom is an incredible optimist, looking for the best in every situation. She desires no pain medication other than Tylenol. She wants to be lucid at all times without the fog of narcotics to dull her senses. I respect that immensely. She has always been a woman who has wanted zero attention on her but looked after everyone else. I honor that in her and thank God as I write. Yet, it's all a bit surreal. I regularly have the privilege of walking families through this season, but now when it comes to my own family, I am experiencing a different feeling altogether. I lack the words of comfort I normally have. My thoughts are cloudy, at best. I have no idea how to support my sister who will be her primary caretaker with appropriate love and compassion. The anguish of my soul at knowing my Mom will not live much longer fluctuates between a warm realization of the rest in store for her in Jesus' arms to a resigned acceptance of the truth that I will no longer have her here for her grandchildren. Oh how many times I lack the right thing to say or think, but somehow this is completely foreign. I am strangely...numb. Let me tell you...this helped. Vs. 18 says... "So comfort and encourage each other with these words." Yes, it talks of death, but it provides me hope in the future life we have as followers of Christ! And Mom knows this as a fact. She is confident in her eternity...why? She summed her whole life this way: "I was once Saul, but now I am Paul." She had a rough go of it early in life, living outside God's will for her, as Saul did. But God changed him...and her! And now she proclaims Good News to people, as Paul did in the Bible, with her life! These become words I now have when I possess none to say! And they are yours, too. Trust Jesus with your life, as Mom does, and receive that security that she has for her future...when death is near. Last night, I visited our PD officer in the hospital recovering from surgery. His accident could have claimed his life, but God is so good and spared him for unknown purposes that we can only be excited about! I can't wait to see how God will use his life for His glory once he has recovered. We know our lives are limited in days (Heb. 9:27), yes. But how thrilling to me that God isn't finished with us... He doesn't discard those he cares about! What encouragement for my friend who was close to death's door! God has a plan and purpose for his life, and I know He cares so deeply for him. But this also has the more direct implication. He also cares about us when we stray...when our thoughts are far from Him. He tries to bring us back. I think of those times when I don't want to be close to Him. My eyes are fixed on myself or the sin dangling before me, and I distance myself. How exciting that God continues to call after us, seek us, and find us. I'm reminded of Jesus' words and why He came - to seek and save the lost (Luke 19:10). That's not just for those who don't know Him...it's for me , too. Would you say you are lost today? I know God wants to draw you close to Him and His fatherly affection. The question is: will you let Him? It is easy to lose hope in the midst of tragedy. Our city/region has taken a one-two punch with our officer in the collision Monday in surgery now and with the horror yesterday in San Bernardino. But I will not give up. Since God graciously allows us the gift of our lives today to do whatever we want - good or evil - I will not give up living for Him moment by moment. It's not about God "fixing" the problem. He already did by coming to earth and entering humanity. And He's not dead...He's alive and knows full well the results of His gracious gift of giving us a free will. Following Jesus is the antidote to living a self-centered life. There will always be those who deny God's existence and then point the finger at Him for all our troubles. It will not be popular or easy to be like Jesus. How might you today not lose heart? How might you fix your eyes on the Source of all comfort and peace and then pass that on to someone else? 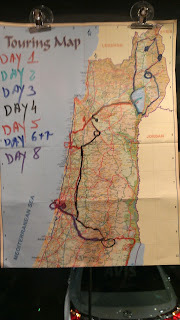 Days 8 & 9 - A Speech, City, Tunnel, Wall, Museum, Tomb, and Long Way Home! 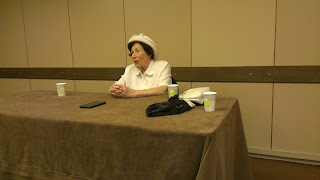 Our last day began with an early breakfast, followed by a living-history lesson from a Holocaust survivor named Hannah, childhood friend of Anne Frank. At 86, she is sharp and witty, yet her words were haunting as she described the horrors she witnessed during the terror of the Third Reich and her relationship to the late diary-writer of international fame. I felt grateful to have heard her experiences, as few will be left to tell others as the years go by. She left me with a firm resolve: "Never again shall this annihilation occur!" Needless to say, these words would come back to me no later than midday. 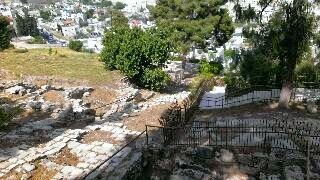 From our hotel, we left for the City - not Jerusalem with the walls around it, but just outside, on Mt. 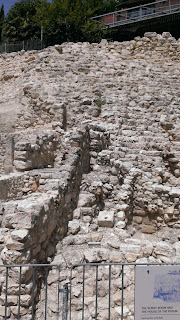 Zion, the Ancient City of David. Here is where Jerusalem began, and the excavations that started here 10 years ago continue, uncovering more and more history. It was thrilling to go through some of the residences uncovered, and a place where some scholars insist is the the edge of King David's palace. From there, we walked through Hezekiah's Tunnel, carved 2700 years ago prior to the Assyrian army attack to divert water from the Gihon Spring into the city. We took the "dry" route, as the spring is active today with fresh water up to your knees! As we exited, we looked across the Kidron Valley, into a less-than-friendly neighborhood, some flying green Hamas flags that hadn't yet been spotted by Israeli forces. We then took our bus to the Temple Mount and visited the Western (Wailing Wall). 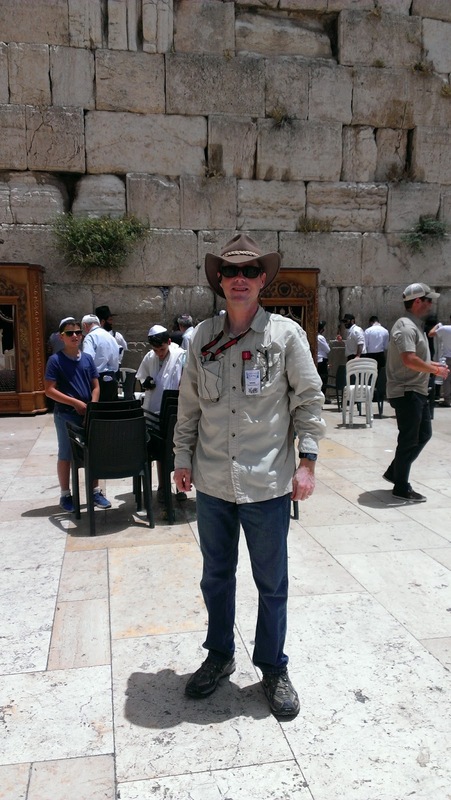 At the entrance, an inscription reads: "The Divine Presence never moves from the Western Wall." I was moved by the magnitude of the surroundings - a small area in size, but big in terms of the prayers lifted to God. The Jewish prayer is vocal, yet there was a reverent silence - until shouts erupted from the many bar-mitzvah celebrations for young men! It would seem these instances of "irreverence" were actually very reverent! And thrilling, for me to write a prayer, insert it into the wall, and sense the Lord with me. Powerful, to say the least. 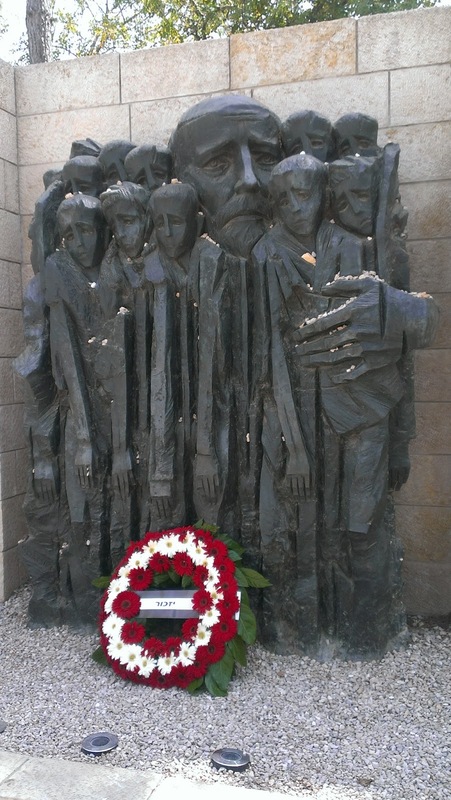 From here, we ate lunch at Yad Vashem, the Museum of the Holocaust, and had a short tour. Here is where that phrase from the morning really came back..."never again!" My heart was sickened as the second and third panels, after describing the Nazi mentality, shared how so many Christians worldwide had such a negative view of the Jewish people and then, in the hour of need during WWII, turned the other way. As a group, we had an opportunity to lay a wreath at the memorial of the 500,000 children slaughtered during this time. My heart broke... my mind failed to comprehend the severity of this destruction of beautiful human life, as some how less than human. Never again. But hope abounded, as we then headed to another supposed site of the tomb of Jesus, the Garden Tomb. 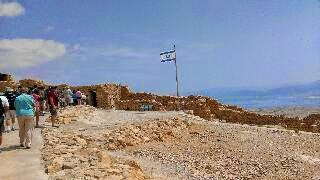 This one, and its proximity to the traditional site of Golgotha (Calvary), seemed more likely from the biblical text. Here we saw an authentic tomb, hewn out of the rock, intended as a family burial spot in a garden. Whether or not this place, or the one at the Church of the Holy Sepulchre, is actually the one used by Jesus isn't the issue. What is? He is alive! And that, friends, was the most poignant way to leave the Holy Land...with the fact that He IS! Sitting there, partaking in Communion with our group, we understood the finality of that act - the one that guarantees our eternity with Him when we place our trust in Him. I didn't have to walk this path, go to a sacred shrine, dress a certain way or follow any set of rules to be counted as His child. No, I merely yielded my will to His, my life to His keeping, and my obedience to God alone. And upon that profession of faith, He receives us as His own. Hallelujah! The journey home was difficult. I didn't want to leave. Even with rush hour traffic (and yes, they have it in Jerusalem, too!) and the 2 hour drive to Tel Aviv for dinner and catching our plane home, I was left feeling like I was actually LEAVING home. Some part of me stayed in Israel. 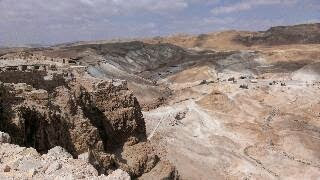 I somehow connected with her beauty: from the Golan to the Negev, and I became attached. The tendency for Christians is to want the end to come, for Yeshua Ha'Meshiach to return. And I do. But let's not miss the present. He died for all people, Jew and Gentile alike. And our task is to love everyone. I want to uphold the people of Israel because of the covenant God made with them; not to proselytize or pander. I saw much more than a land. I saw a people that God has blessed and through whom all will be blessed. And I am grateful, more than I could possibly say, for this opportunity. How do you see Israel? If you are fortunate enough to place your feet where the patriarchs walked or shoes where David danced, or hands where Jesus healed, you have a different glimpse. But do you see the people? Do you see a nation? God is still in the business of miracles, and all you have to do is look to this one spot to see that He has blessed her and us. Today we started early and began the 2nd of our 3 days in the Old City by entering the Moslem Quarter at the Lion's Gate. (We know it as the Sheep Gate in the Bible due to the livestock sold there up until the early 1970's. We walked alongside an old Muslim cemetery en route to the Via Dolorosa, the path traditionally said to be the one Jesus took to Calvary. First stop: St. Anne's Church, built by the French and was remarkably left standing after the Suleiman invasion due to it's phenomenal acoustics that they used to train the men who issue the Islamic call to prayer. 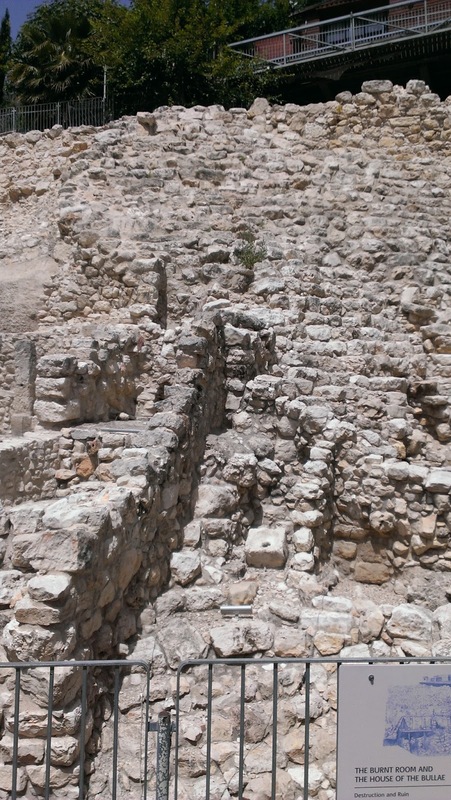 Here archaeologists discovered underneath several layers of building, the actual pools of Bethesda (meaning "house of mercy") in Hebrew that Jesus healed the lame man in John 5. We then entered the church and tested the acoustics in worship...what a thrill! As we reentered the narrow street, this quarter was filled with scents and spices, Turkish coffee and fresh meat, and sweets that would send anyone into diabetic shock! Lots of bargains to be had but none I took advantage of! We then entered the Church of the Condemnation and Flagellation, the very site where scholars and scientists believe Jesus was mocked, flogged, and dressed up as a king, spat upon and stood trial before Pilate before finally being led off with the cross-member across his shoulders up the road to Golgotha. This placed moved me dearly, as I sat upon the exact stone courtyard (now underground due to the City being built on top) that Jesus endured the harsh hand of the Roman garrison. If you've seen that horrible part in The Passion of the Christ, you know what I mean. Etched in those stones were the game squares used by those soldiers to cast lots, the game of chance played for our Lord's garments. A wow moment, to be sure! You may also know this place as the Antonia Fortress, a place Paul knew, as well. Preserved here in this church are the remnants of the Hadrianic Arch that spanned across the street and sidewalk as you entered Jerusalem. This was my favorite stop today. We wound our way through tight corridors and came to the Church of the Holy Sepulchre, a joint effort by Roman Catholics, Armenians, Copts, and Greek Orthodox mark the place Jesus was traditionally crucified, wrapped for burial and then entombed. It was an ornate experience of all the different brands of the faith coming together to honor Christ in their own way with their own interpretation of the last 4 stations. What struck me were the number of nationalities present: Indonesian, Indian, German, Greek, Russian, Canadian and Filipinos...all together to be where Jesus was. These are the facets found in the diamond of Christ's Church. The question is, do we recognize those different from us as such? Faces and shapes and new flashes of holy light in a dark world that Jesus can use for His glory! We finished today with lunch at another kibbutz hotel and restaurant, this one nearer our hotel that suffered intentional damage during the war. From here you had a panoramic view of Bethlehem, now not toured by groups due to the high level of danger for foreigners, especially those like me! I saw God's hand today, as we prayed for Donna, who has become a good friend this trip, and her heart issue. As we knelt on those cobblestones where Jesus' stripes would heal us, she received the healing she needed to keep going, as her a-fib subsided. Isn't it great when God answers prayer so directly?!! Today's post is probably too short for you, but my heart and head are full. What about these words hits close to home? Is there a take-away for you to apply in your life? Lord, bless those that read this and their walk with You...THE Way, the Truth and the Life...amen! It's 9:30PM and I am on overload tonight...physically, as we walked a lot...mentally, as we took in so much information, and spritually, as I'll attempt to describe. 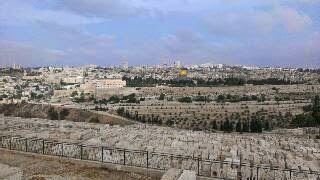 We learned about the Jewish cemetaries here, atop where Jesus taught the disciples. 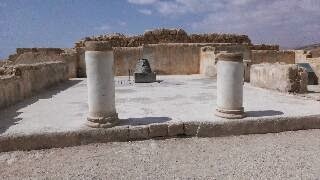 At the base, the tombs of Absalom, St. James, and Zechariah still exist. 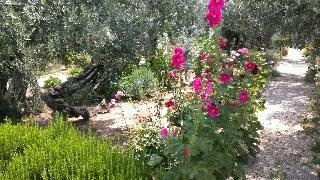 From here we walked down to Gethsemane, the actual Garden where Jesus prayed and found the disciples sleeping. A church was established called All Nations, as 16 countries founded it. So much was here including a 2000 year old olive tree, that is the lone living witness to Jesus' presence then. I have to say, this one place moved me more than any other today. I knelt inside the church and had time to reflect on what Jesus did here... His agony... His betrayal... His abandonment by His closest friends... What could all this have felt like for Him? And to add to that, His knowledge of what would come next: "Oh that this cup would pass! But not My will, Abba, but Yours." Can you imagine the depth of emotion in words like this? I'm not sure I can. Kneeling there, I pondered it. And the years came. Alone, rejected and despises, a man of sorrow acquainted with grief. And surely He bore our sins...freely! Will you consider the Garden today? Among its vibrant green trees lies a profound sense of death. And it calls to me to die to self yet again. I'll admit... I wasn't myself the rest of the day. And that, in hindsight, was good. We then drove past the Dung Gate, around Mt. Zion in the south and then to the west side and entered Jerusalem at the Jaffa Gate into one of 4 sections of the city - the Armenian Quarter. We dined at an Armenian restaurant, whose family established it as a grainery in 1882, and here I had my first of 2 cultural lessons. I wrongly assumed the staff were Armenian, and upon beginning a dialogue with our server (Who, me? Talk to a stranger? Yeah, I know...keep going with the story! ), I learned she was a Palestinian. (I will withhold her name for safety reasons.) I noticed a cross around her neck and asked her about it. She shared she is a Lutheran, formerly of Bethlehem, but now living in the Old City. Persecution of Christians by the Muslims there is quite oppressive. She is forced to observe their restrictions, and even participate in fasts or face punishment. Ten years ago, the city, in the West Bank, was 90% Christian. Numbers now hover around 10% since Israel conceded the territory to the Palestinian government. She said she had a much better life even as a minority still in Jerusalem than back in her home city. It was telling. We think WE face "persecution" all the time. She did, and still does. But she is proud of her heritage and faith in Jesus. To even wear that necklace means hatred, but she identifies with Jesus Christ. She is glad to do it. I needed that reminder; how about you? We walked through many narrow streets, full of shops and residences, into the Jewish Quarter. Today is the Sabbath, and most were returning from services. Tonight begins Shavout, or Pentecost...the Feast of the Harvest 50 days after Passover. We wished many "Shabbat shalom!" 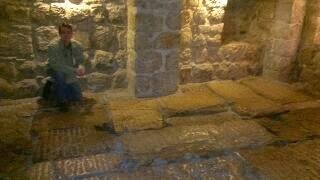 Here we visited King David's tomb and were separated, men from women, as in any Jewish holy site or synagogue. We then went around the corner to a place significant to the Son of David, the Upper Room, where traditionally it's believed the Last Supper took place. From there, we exited at the Zion Gate in the south and went a short distance to Dormition Church, the site of the High Priest Caiaphas' house. 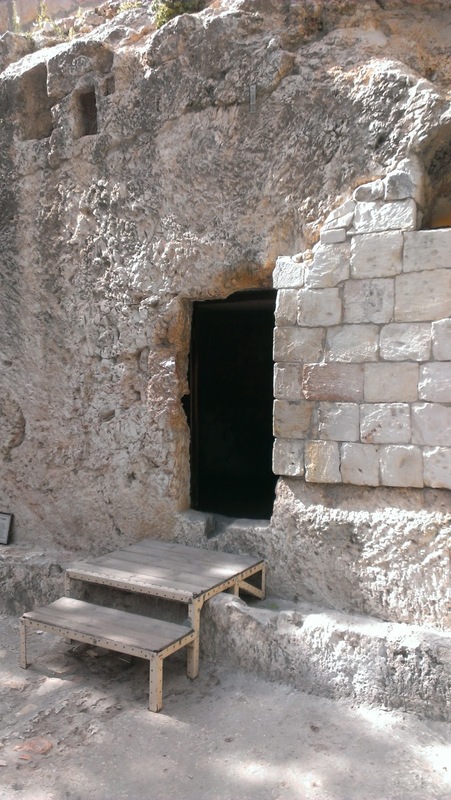 Here Jesus was charged and held overnight in the dungeon, dropped into a pit in the basement, after his arrest by the Jewish guards in the Garden. What touched me most here were the original stair-steps Jesus used, both as a free man after the Last Supper, and then as one condemned to die. I touched one (reaching over the fence!) and thought how my Lord may have placed His sandal there. I felt a lot like the woman who wanted to touch just the hem of Jesus' garment to be healed. I know, however, that my healing in Him has already come! He is with me and will never leave me alone or without hope. Sometimes we need a touchstone to remember this fact. I pray these words will be one for you today! I.commented how good his English was and how hard I'm sure it must be for him. He said the opposite...how hard Arabic is, even as a native speaker, he still flunked tests in school, but excelled in English. How? Even when mocked by his friends, he insists on renting American movies without subtitles. We parted with a firm handshake and blessings in his studies. Family, there is so much good to be had if we are willing to open up and extend the peace of Jesus (shalom, salaam) to others. How might you do that today? Our first morning in Jerusalem didn't start with the sites locally but an hour and a half ride southeast. 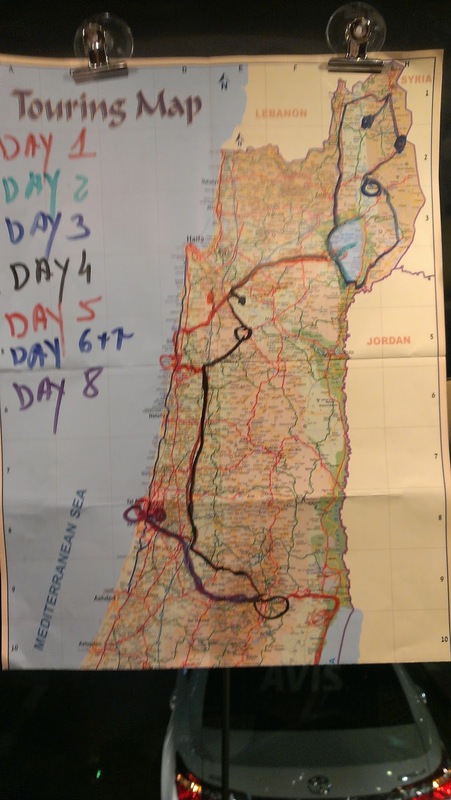 This route led us out of the City and bisected the areas of Samaria and Judea, what is known today as the Palestinian West Bank. Our first stop: Masada. For those of you who are too young to remember Peter O'Toole in the epic movie (which by the way was extremely accurate according to Jewish archeologists, except for a fabricated love scene) this was King Herod's mountain top fortress that 900 Zealots took over in the rebellion against Rome after the destruction of the Temple in AD 70. Two years later, a rebel named Eleazar was defeated, as the 10th Roman legion, 15,000 strong, penetrated the citidel, using captured Jewish prisoners to build a ramp. After an aerial tram to the top, I saw that so much of this has been restored and preserved. Herod built an elaborate palace, complete with food and water reserves, a state-of-the-art sauna (the dude was nuts...it's the desert! It's already hot!) and a water-collection system -- the ultimate bomb shelter because he knew it was just a matter of time before chaos broke out against him and Rome! Speaking of hot, getting there before 8AM ensured the heat wouldn't get the best of us! Jews today honor the sacrifices made here and vow this land won't be lost again. We then did get hot, taking a 1 mile hike into an area known as Wadi David, the place believed to be the cave where David ran from King Saul to hide from him. It's an oasis in the scortching desert, complete with a natural spring and beautiful waterfall! Gorgeous! Here, I reflected on just how good God is! He is my Oasis on the Desert! How would you describe Him? Then we journeyed to a place w for lunch where many in the past described Him in writing...the caves of Qumran, where one shepherd found the Dead Sea Scrolls! 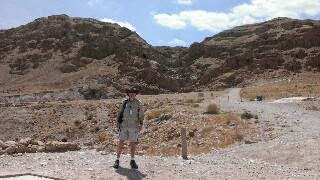 We then headed off to the Dead Sea, the lowest point on the earth at 1200 ft. below sea level. What a contrast to Jerusalem at 3000+ above sea level. That's why no matter where you are in this land, you are always going UP to the City! While there, we had a chance to float in the water - 33% salt - and rub the mineral rich mud all over my skin. I may be a bit sunburned, but my feel baby smooth! The highlight was going out into the deeper parts, not touching the bottom and still floating like a cork in water...an amazing feeling. Since salt would harm my phone, we had a designated photographer, so pix later! After that, we headed back and had a good cultural lesson on the various minority groups here in the region. Tonight we began the Sabbath at sundown, after dinner. Elevators automatically stop at each floor so that an orthodox person doesn't operate an electronic device, a violation of Sabbath law. We wished others "Shabbat shalom" as we sang praises to the Lord on the 4th floor outdoor balcony. We honored a holy God in His city for His power and majesty revealed in His creation today. How will you praise Him tonight and what for? © mikespradlin.com, 2014. Picture Window theme. Powered by Blogger.